These are some of our favorite things from Edison’s toddler years. How To Get Your Child to Sleep In…This Works! Posted June 26, 2013 by Mom-E1 Comment on How To Get Your Child to Sleep In…This Works! If you have a young child that gets up way too early, you have to try this awesome way to get your child to sleep in in the morning. All kids are different, but we consider these to be some of the best books for 2 year olds. These stackable, nestable, fit-together-and-roll-around cups are a fantastic (and inexpensive) toddler toy. The Plan City Airport is one of my toddler’s favorite toys and it is easy to see why. Some of my spirited toddler boy’s favorite gifts. 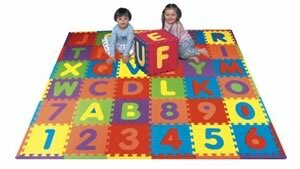 Alphabet puzzle mats are one of our favorite toddler toys because it makes it easy and fun to teach your toddler the alphabet.